Work, work, work… It never stops! But every student will agree; it’s all fun. There is a lot of variety in the Fashion Business world. From styling to the fashion’s history; the students learn it all! Here is a small look into their activities: Fashion Visual Research and Presentation, Introduction to Project Management, Introduction to Fashion Styling, International Branding, Fashion Marketing and Promotion and Introduction to Historical and Contextual Studies. 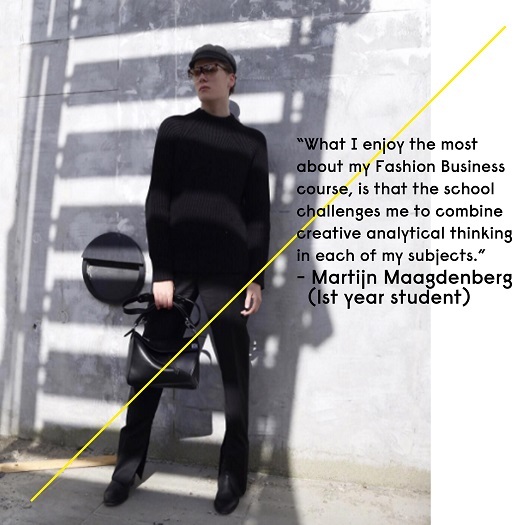 After the first year they also focus on: Historical and Contextual Studies, Fashion Branding, Industrial Practice in a Global Context, Fashion Styling, Fashion Communications and Fashion Forecasting. As a Fashion Business student, a day consists of researching, writing reports, watching documentaries… but there is also lots of creative activities! Like creating mood boards, digital and live sketchbooks, create hand drawn logos and sketches… It’s not just writing and learning as most might think! As you may have been seeing on our social media channels, there have been some amazing work produced! Our students are dedicated, inspirational, excited, creative, different and we couldn’t be more happy with their work! Well done!